After leaving Port Townsend, we journeyed to the Kent/Renton area of Washington just south of Seattle where we will be leaving our rig. In September 2016, we met Teddi & Roger on the Schoodic Peninsula in Maine where we were volunteer bird counters in Acadia National Park. Teddi's brother, Tim, had told them about our website, and Teddi read through a bunch of it one week while she was on jury duty. They aren't full-timers, but in 2016/2017 they were on a year long tour of the country hitting as many National Parks as possible. We had a nice lunch on the wharf in Corea back then. Well, they emailed us a few weeks ago after they saw we were going to be in their general vicinity, and offered to allow us to boondock or "Moochdock" on their property. We had booked our flight to Iceland out of Seattle and had made arrangements to leave our rig nearby at a Boondocker's Welcome spot. But that host's plans changed, and when Teddi mentioned they had room, we asked if we could possibly stage for our trip and leave our rig there while we were gone. They graciously said yes, and we pulled in last Friday. 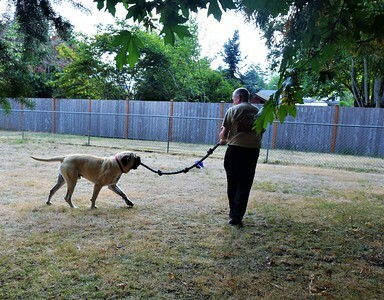 We were introduced to their puppy, Riley, a very large 160-lb English Mastiff puppy. And they offered us an electric hook-up, which we've very much appreciated. But we're going to clean out the fridge, and turn everything off, so we'll disconnect. 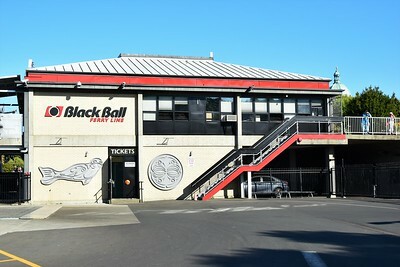 When we leave, we'll be parking the rig in the area between the fences in the photo above, and our solar panels will keep our batteries charged. Since we've been here, we've been receiving packages from Amazon with little last-minute items we thought we might need on our trip. And I've been tweaking and re-tweaking our plans. We fly out on Wednesday, August 15, and we have a seven hour direct flight to the Keflavik airport in Iceland. They are seven hours ahead of Seattle, so we'll be arriving at 5:00 a.m. their time on the 16th. When we return, we'll be arriving at the same time we leave Iceland. 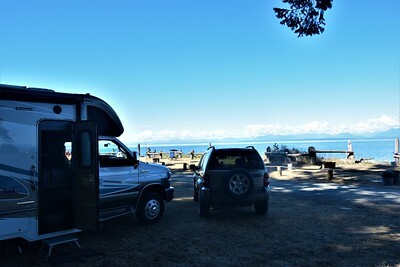 We are renting a 4WD camper van from Cozy Campers, and touring the country for 30 days. Here's a video on the van. Iceland's total area is slightly smaller than the state of Kentucky, so it's not a big country. 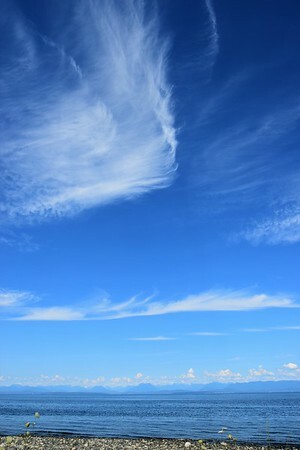 But it's packed with incredible landscapes, and we look forward to seeing as much as we can. We won't be spending any time in the largest city, Reykjavik, other than to pick up and drop off the van. Iceland has over 330,000 people, and well over a third of them live in Reykjavik with over two thirds living in the "Greater" Reykjavik area. Therefore, we will be spending all of our time elsewhere and trying to dodge the most touristy spots at their busiest times. Iceland is a relatively new "hot" tourist destination, but they don't yet have the infrastructure to support the demand. You have to book lodging well in advance, and there is little to no flexibility if you decide you want to stay in an area longer. That's a big reason we went with the camper van. There are lots of campgrounds, and most of them are big open fields, so they don't fill up. We wanted that kind of flexibility. And we went with 4WD (much more expensive) because it is required to reach many of the more remote points of interest. We are supposed to have pretty good internet across most of the island, but we'll have to see how much we will be able to keep everyone updated. We paid for a 4G hotspot (like a Verizon JetPack) with unlimited data, so we hope to be able to at least upload a few pictures as we go. The cost of that is a little over $100 for our entire trip (a little over $10/day for the first 10 days and then free after that) - sounds too good to be true, so we'll soon find out if there is a catch. In the meantime, the last few days have been filled with a variety of little chores. A few weeks back, we did an overnight backpacking trip in Olympic National Park. Well, when we got out our tent, all the waterproof sealant had melted and it was extremely sticky. We made it work, but since the manufacturer (MSR) is in Seattle and they have a repair facility here, I thought I would take it in to see what they said. Well, they looked at it for about a minute, and went in the back and handed us a new one. Apparently, there was a bad batch, and they made it right immediately. Check that off the list. We're planning to do a little backpacking in Iceland, so that was a step in the right direction. Thank you MSR and Cascade Designs. We also got our prescription refills taken care of so we won't run out while we're gone. Check. I sent off all our documents to Florida to get our Jeep registered there. It took forever for Kentucky to send us our title, but once we got it, we were just waiting until we got here to get everything together and find a law enforcement officer to do Florida's required VIN verification. The Renton Police Dept. took care of that for us. Hopefully, we'll have our new plates when we return. Check. Linda got her sister's rock turtle mailed. She coated it with polyurethane to make the rocks shine a bit. I worked on a few of our RV-Dreams.com web pages. I updated the "What's New?" page, and created a new page called "Our Home On Wheels - Chapter 2" to reflect our change from the fifth wheel to the motorhome and to provide details on our Winnebago Aspect 27K. And I updated our Frequently Asked Questions (FAQs) page. It's a start, but I've got a lot of work to do to update many other pages that have been neglected. Still, it was something I've been needing to do, so I'll give that a "Check" as well. Other than that, Roger has been preparing us dinner almost every night. 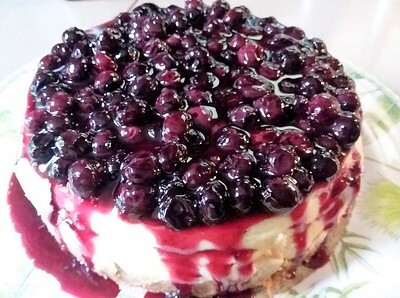 Linda used some of their fresh blueberries to make an Instant Pot blueberry cheesecake. Roger & Teddi have the perfect situation for us, and we just can't thank them enough. On our last day before leaving, we made a quick trip to the nearby KOA and dumped tanks. When we returned, we parked in a different spot where we will get full sun on our solar panels. And I, for the first time, put tire covers on. Check, check, and check. We have packed and gone through our checklists multiple times. Check and re-check. In the morning before we head to the airport, Linda is going to defrost the refrigerator, and we'll lock everything up. We just want to leave the RV so that Roger can just hop in and drive it out of the way if necessary. They are also giving us a ride to the airport. Again, the people we meet RVing are just so wonderful. That's about it. Let the adventure begin!! 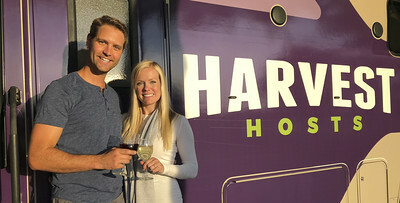 Harvest Hosts was created nine years ago by Kim & Don Greene. They graciously sent us a couple of free memberships for all or our Educational Rallies to be used as door prizes. 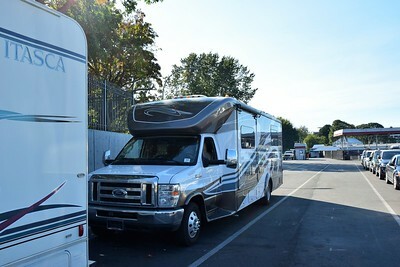 Earlier this year, with the purchase of the smaller motorhome, we joined ourselves. In June, we got word that Kim & Don sold Harvest Hosts to Mary Ashley & Joel Holland. "After hundreds of nights spent RVing through all 48 lower States, our biggest gripe was the lack of unique RV overnight experiences. Then we joined Harvest Hosts, and after staying at incredible locations from wineries to alpaca farms, it changed our RV lives. In 2018 we purchased Harvest Hosts from the original founders, Don and Kim Greene. They built an amazing company and community, and we look forward to continuing the tradition of connecting our wonderful members with wonderful hosts!" With our new membership and their new ownership, I reached out to Joel to congratulate them and see how we might be able to work together more. They have changed the company logo and the website, and are intent on adding more hosts and more members. With that desire, they have offered us the opportunity to provide our readers with a 10% discount on memberships (regularly $49/year). UPDATE: Effective January 1, 2019 the annual membership increased to $79 for NEW MEMBERS. However, the discount we offer you is now 15% rather than 10%. 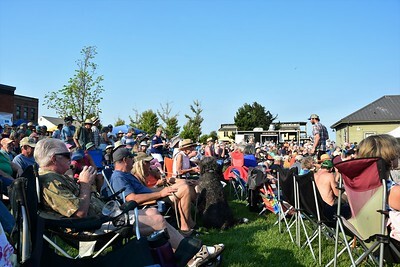 UPDATE: Harvest Hosts has purchased RV Golf Club, and effective January 1, 2019, Harvest Host Members can add on free camping at over 300 golf courses for $27/year locked in for life (a 70% discount off the RV Golf Club regular rate of $99/year). 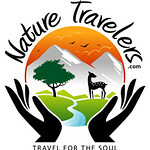 By clicking on any of the links in this post or on any of the banners in this post, on the sidebar of the Journal, on the Forum, or anywhere else on the RV-Dreams.com website, you will be taken to the Harvest Hosts website where there will be a Coupon Code at the top of the page to get 10% (NOW 15%) off if you join. Now, Joel & Mary Ashley wouldn't come right out and say this but I will. If your ONLY reason for joining Harvest Hosts is to get "free" camping with no intent to patronize the establishments offering this overnight benefit, then please don't join. Harvest Hosts is more about being able to stay in unique locations outside crowded RV parks and campgrounds and to meet interesting and wonderful small business owners across the country. 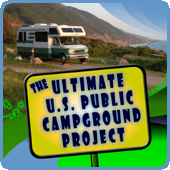 The hosts are not providing campgrounds, and these opportunities shouldn't be treated like that. Certainly, the hosts are kind folks, but they also become hosts because it's an opportunity to provide their businesses more exposure and pick up a few more sales. 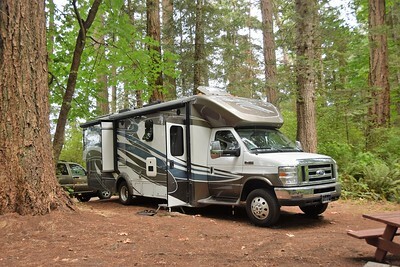 So, think of the free overnight stay as a way to save a few dollars, all or a portion of which, you can use toward some great wine, beer, produce, or gifts for friends and family ... while at the same time parking at interesting venues and avoiding the masses at the popular RV parks and campgrounds. With that said, there is an official "Code of Conduct", so please read through it before joining - it's mostly common sense. Members acknowledge that they are insured pursuant to state or provincial laws and agree to take responsibility for their actions and any resulting consequences. Proof of such insurance must be carried in the vehicle. 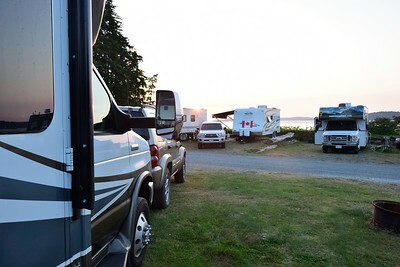 The Host locations have no responsibility for damage or theft to your RV, tow car or personal property, or for injury to you, your family or guests. If you are okay with all of that, click on the banner below to learn more and look for the coupon code at the top of the page if you should choose to join. 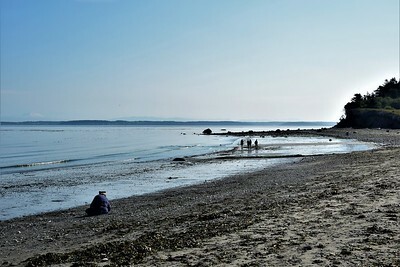 A big reason we came to this area was for Linda to check out a couple of beaches in Port Townsend known for sea glass. 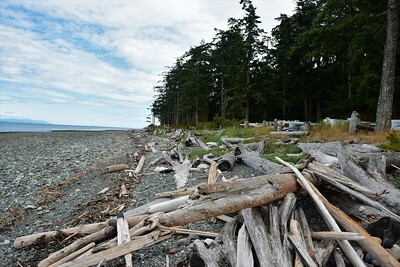 The whole area from North Beach Park all the way west to McCurdy Point is prime beachcombing territory. 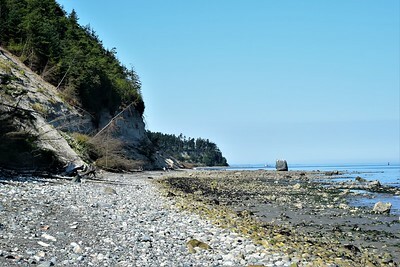 A section near McCurdy Point is referred to as "Glass Beach". Apparently, many years ago, dump trucks would back up to the edge of the cliff and dump trash down on the beach and into the water which is why it's a good spot for sea glass now. There are still remnants of old vehicles there. Access to Glass Beach requires a walk of almost three miles on the beach from North Beach Park. Linda's knees were acting up, and she knew she wasn't going to be able to do six miles round-trip, but she still wanted go and see what we might find. We checked the tide charts and saw that low tide was around 8:00 a.m. It's very important to check the tide charts, especially if hiking all the way to Glass Beach - the water comes all the way into the cliffs at high tide and can cut off your return in some places. Another website says that tides of six feet and higher are a problem on your return, plus, as the tide comes in, it covers the treasures you might be seeking (glass, quartz, agates, etc.). We arrived at the North Beach parking lot around 8:30. Just walking out from the parking lot, we immediately started seeing lots of small pieces of glass. 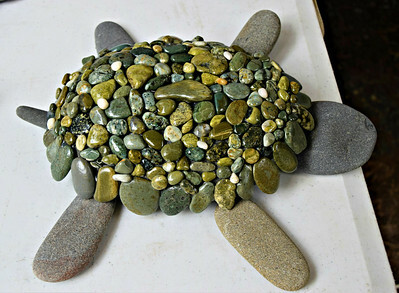 Supposedly, there are larger pieces at Glass Beach, but Linda is planning on making mosaics and doesn't need big pieces. some of whom were quite serious. It was men, women, young people, old people, couples, etc. - it's certainly not a "secret" beach for glass. But there was glass everywhere. We met Mike who is from eastern Washington visiting his brother here. He's also an RVer and enjoys finding glass. He's a 74-year old widower that is in great shape and exercises a lot. After we all looked for glass in the same spot for awhile, he left Linda his miniature rake, and the two of us walked toward McCurdy Point having a wonderful chat and occasionally stopping to pick up some of the prettier colored glass. We walked and talked until he figured he should get back to his trailer to take his dog for a walk. When we got back to Linda, she had a little girl sifting through the rocks with her. And she lamented the fact we were back so soon because she figured I would want to leave. Well, we decided I would get her a couple of snacks out of the Jeep, leave her sitting there, and come back when she called me. While at the Jeep, I found a note on our windshield. Paula said she has been following us for years, welcomed us to Port Townsend, and left an email address. I later emailed her and learned she lives about a mile from North Beach, and had a feeling that's where we would be. She recognized the Jeep, and the Kentucky license plate confirmed it was ours. Linda called me around 1:30, not because she was ready to leave, but because the tide chased her off the beach. As she waited for me, others arrived asking "Where do I find the glass?" She informed them it was all now underwater and advised them to check the tide charts. She ended up nearly filling a quart-sized Ziploc bag with glass, and she never went more than 50 yards from the parking lot and most of it was collected in about a 10-foot radius. It was a given that she would be returning tomorrow morning with or without me. When we got back, she decided to get some laundry done. 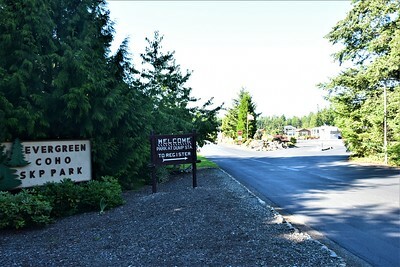 Here at the Evergreen Coho SKP park, you have to sign up for time slots to do laundry. They have a big laundry room, so she went over and found machines open for the 3:00 time slot. She signed up and got that knocked out. While she was on the beach, I made plans with our friends Bill & Diane to go to dinner at 5:00. They are full-timers that have been on the road longer than we have, and they are from Washington so we've gotten some great tips from them. They picked us up and we went to a local restaurant, Scampi & Halibut Seafood Grill. It's not fine dining, but it was as Bill & Diane described - very good, consistent, reasonably priced seafood, with some nice highlights like their coconut almond rice and caesar salad. And Diane is a big fan of their blackberry milkshake - still wishing I would have gotten one. 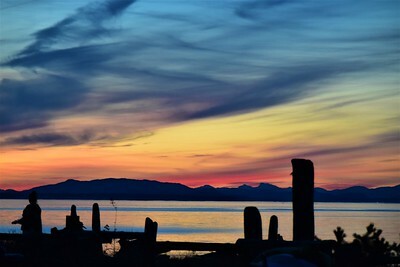 After dinner, they gave us a quick driving tour of Port Townsend, and then we ended up at Finnriver Farm & Cidery, which had been recommended by one of the "glass" ladies on the beach with Linda this morning. It was a spur of the moment decision to check it out. I became the designated driver as the other three enjoyed a "flight" of five cider tastings. It was a very enjoyable evening, and it was great to spend some time with Bill & Diane again. Back home, we called it an early night. Linda was up and out early this morning. She headed back to North Beach a little before 8:00 while I stayed home and took care of a variety of items. The best news of the day was learning that our tenant in our little rental house in Florida wants to renew for another year. That made our day. 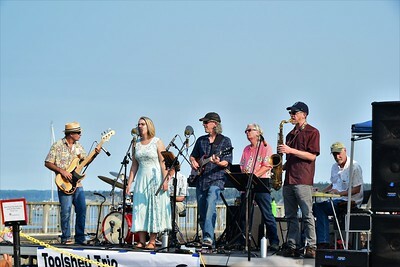 Paula, from the note on the Jeep yesterday, ended up joining Linda on the beach for a little glass collecting, and I confirmed plans with our friends, Sam & Carolyn, to go to Port Townsend's Thursday night "Concerts on the Dock" series. It runs from 5:00 - 7:30, and folks start arriving around 4:30. Linda returned around 2:30 after the tide once again forced her to leave the beach. She got almost as much glass as yesterday and stayed in just about the same spot. At 4:15, Sam & Carolyn picked us up. Sam dropped us off with our chairs, and we found a nice spot on the lawn. We had a nice view of the Toolshed Trio which had grown into six band members and four additional singers. The crowd filled in around us. Paula and some of her friends were there as well, so I got to meet her. Always a pleasure to get to meet those that have been following us for several years that we've never met before. 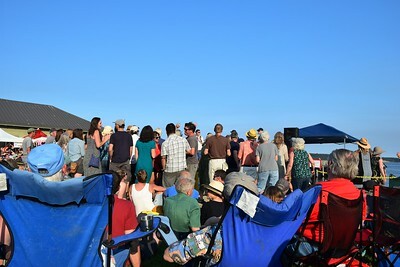 Soon, we learned that the Port Townsend folks like to dance. 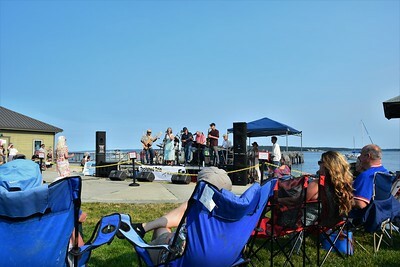 Soon, our view of the band and the harbor backdrop was obscured by all the dancers. And what an eclectic mix of dancers it was. Many were in their own little world, and it was some of the best people-watching we've done in a long, long time. They were happy and uninhibited, and I'm guessing some were under the influence of a particular herb. For the record, Washington joined Colorado as the first states to legalize recreational marijuana in 2012, and I think some recreational use of the locals may have contributed to the fun we had tonight. Just a hunch, I could be wrong. In addition to the people-watching, the band had quite a repertoire, and they were pretty good. The three female singers were excellent. We had sandwiches from the Mo Chilli BBQ food trailer that were excellent as well. Linda said her brisket sandwich may have been the best she's ever had, and my pulled pork sandwich also ranked right up there. We were impressed. I almost ordered some BBQ to go. They sold beer and wine at the venue, and they have a unique deal to reduce the use of plastic cups. For $5, you can get a stainless steel or pottery cup to use for the evening and then you get your $5 back when you return the cup as you leave. And, conveniently, right next to the park, is the Elevated Ice Cream & Candy Shop. A couple of small sundaes topped off the evening just before the music ended around 7:30. It was another enjoyable evening and another reminder of why we like smaller towns. We are leaving tomorrow, but there is a good chance we may make another pass through here after we get back from Iceland in September. It was a great couple of days here with our friends, but now it's time to move on to get organized and prepared for our upcoming trip to the Land of Fire & Ice. We only had 38 miles to drive today, so we were in no big hurry to leave our Walmart parking spot in East Port Angeles, Washington. Linda went into the store to grocery shop for the next few days and to get supplies for our Iceland trip that begins next week. We're going to take a bunch of food with us because it's so expensive over there, and we want to save our discretionary dollars for other things. While she did that, I gathered up all the baskets that some of the other RVers had just left way out in the parking lot, and I rolled them into a corral. It's such an easy thing to do for the privilege of being able to park overnight for free. Once she was back, we hitched up the Jeep and rolled out. 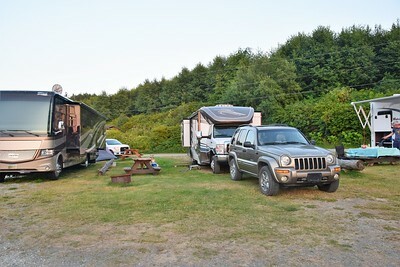 We fueled up both vehicles now that we're back in the U.S. where gas is much cheaper, and then proceeded to drive to the Evergreen Coho SKP RV Park in Chimacum, just south of Port Townsend. 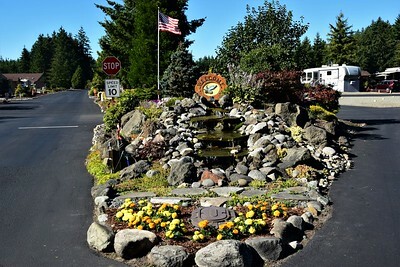 It's one of 11 Co-Op (Co-operative) RV parks formed with the aide of the Escapees RV Club, but managed and maintained by the individual members of each particular co-op. Formally, a Co-Op is defined as "an autonomous association of persons united voluntarily to meet their common economic, social, and cultural needs and aspirations through a jointly-owned and democratically-controlled enterprise". If you are not an actual member of the particular Co-Op park, you must be a member of the Escapees RV Club to stay at the Co-Op parks. We have been Escapees members since we started on the road back in 2005, and this will be our sixth Co-Op park. By the way "SKP" is the shorthand for "Escapee". We pulled in a little after noon, forgetting that the office is closed from noon to 1:00. But they ask that you dump your tanks at the dump station before parking, so we just took our time doing that and filling our fresh water tank. We also unhitched the Jeep, and then pulled into one of the dry camping sites just beyond the dump station. Daily rates are $25 for full hook-ups, $20 for water/electric only, $7 for water only, and $5 for dry camping. The full hook-up sites were all taken, but there were water/electric sites available. Since we're only staying three days, we decided to just dry camp and save a little cash. It was a little over $16 for the three nights. And that comes with a very nice dump station and a place to take on water, plus access to the old, but clean bathhouse (showers are free), and access to a nice, big laundry room. And they have a propane filling station which we will take advantage of the day we leave. 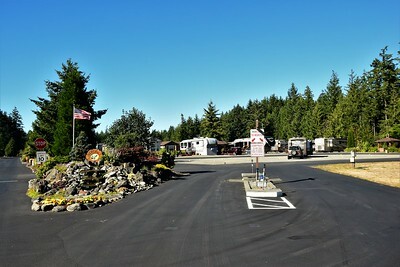 We got set up in our gravel parking lot, and two sets of friends, Bill & Diane and Carolyn & Sam greeted us. We hadn't seen either couple for quite some time, so it was nice to hook up with them again. After boondocking for the last four days and watching our water consumption, Linda & I were ready for a nice long shower, so we walked to the clubhouse where the showers are located and knocked that out first thing. 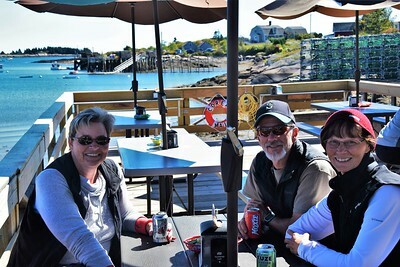 We enjoyed a little "happy hour" with Sam & Carolyn, and then we went to the clubhouse to check in on a couple of the activities on the park calendar. But, apparently, the calendar is wrong and nobody was there. So we just went home and relaxed. 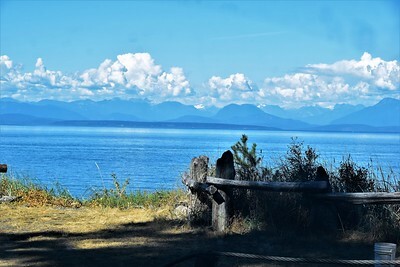 The reason we came to this area was to satisfy Linda's desire to hit a couple of beaches near Port Townsend that are known for sea glass. And we get the added benefit of visiting with some old friends. I have to say that this park is very pretty as RV parks go. It is so clean and landscaped beautifully. 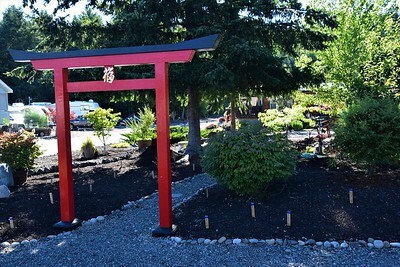 They are just finishing up a Japanese relaxation garden. The wide, paved roads are nice, and you can tell RVers planned it. Though all the Escapees Co-Op parks have been immaculate, they are different ages in different terrains with different "personalities" and management philosophies, and they all have their draws. One of the draws of all of them is the very inexpensive retirement living. They are certainly worth looking into, but you may have to go on a waiting list to get in if you are interested. The current waiting list here has about 120 people on it. Anyway, we'll be here for three nights, and then we move down south of Seattle where we will stage for our trip to Iceland and leave our rig behind for a month. We're spending a month in Iceland in a 4WD camper van, so when we get back our little motorhome will feel like a mansion. That's it for another day in the life. Until next time. For 2019, we will still be traveling in the western U.S., and since the facilities were great for our 2018 Rally, we are going to return to Nevada Treasure RV Resort in Pahrump, Nevada for our 2019 Spring Educational Rally. We are still working out the details on pricing, but it should be similar to what we had for this past April. We'll update that information as soon as we finalize our contract. The main purpose of this posting is to notify everyone of the dates so those planning to attend can plan ahead. We have set aside 50 RV sites for this Rally, and remember that 20% - 30% of our Rally attendees do not have RVs yet or do not have the RV they plan to full-time in. 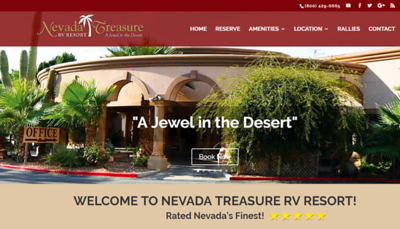 Nevada Treasure does not have cabins, but there are several options for accommodations in the area. Please follow the links provided to the 2019 RV-Dreams Spring Rally Information Page and read through the details to see if it is an event you may want to attend. Registration will open in mid-September - there is no need to reserve an RV site until you register. 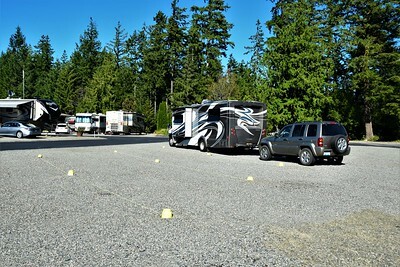 We look forward to seeing many of you at the 2019 RV-Dreams Spring Educational Rally next April, and feel free to contact us with any questions you may have. P.S. We are not sure if we will be holding a Fall Rally in 2019. With tentative plans to make a trip to Alaska next summer, it is more likely that we will not, but that could change. This time, we got a reservation for the Coho Ferry from Victoria to Port Angeles. But we just got it a couple days ago, and all the early sailing reservations were booked. So, we're taking the 7:30 p.m. ferry from Victoria, and we have to be in line at the terminal by 6:00. 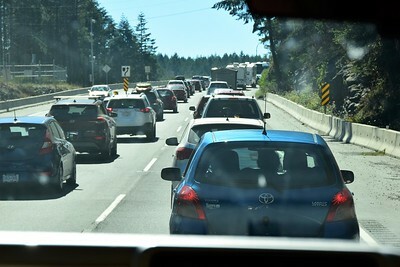 We decided to go ahead and leave today, Monday, because it was a provincial holiday - BC Day - and we thought that might help getting through construction. 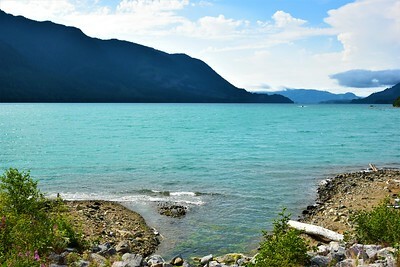 It's only a 150-mile drive from Kitty Coleman Provincial Park to the Black Ball Ferry Terminal. 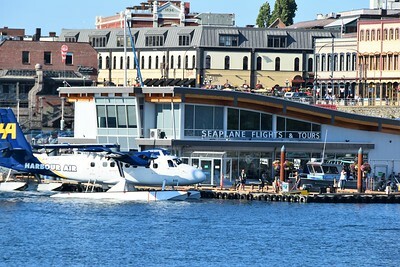 However, based on our experience the day we arrived on Vancouver Island, we're allowing a lot of extra time. We left Kitty Coleman at 11:00 a.m. giving us seven full hours for what should be a three-hour drive. We'll have a leisurely lunch somewhere and spend the few dollars of Canadian money we have left. The trip went fine until we tried to find a place to pull off for lunch. The places with large parking lots were on the left side of the road, and we noticed them too late. Eventually, we turned off the main highway based on roadside signs indicating food. Again, no luck. Either the parking lots weren't big enough, the places weren't open for lunch, or they were closed due to the holiday. Of course, had we been in the fifth wheel, we never even would have attempted to just randomly try to find a place to stop for fear of getting in somewhere we couldn't get out. Linda has no fear in the little motorhome. 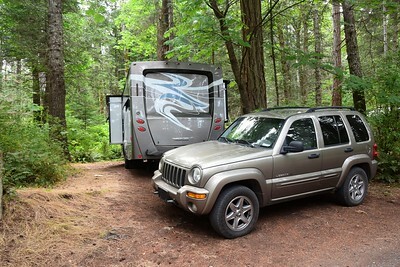 We saw some RVs at an A&W, so Linda wriggled her way into that madhouse and found a safe spot to park. It seemed everyone in the province stopped there for lunch. Linda remarked It's been a long time since we've had fast food", and I responded "Your not getting it here either" because it certainly wasn't fast today. Everyone was waiting a half an hour to get their order. Fortunately, we had time to kill, but there were a lot of frustrated, angry customers. Once we finished lunch, we were back on the road, but my Google Maps indicated there was a 50-minute delay ahead. Yep, this is why we gave ourselves a lot of extra time. There were no construction workers today in the construction zone, but they have this section of the road that funnels down into one lane for a little ways, and then it opens back up into two lanes and then it goes back to one. So the hold up is created by everyone having to merge down into one lane multiple times rather than just having one lane open through the construction area keeping the traffic flowing - slowly, but moving. A sign on the roadside said "Expect up to 90-minute delays". Luckily, it wasn't quite that bad, but over half of our last hour and a half on the road was spent in a stretch that was only about three miles (5k) long. At least the construction right on the edge of Victoria wasn't nearly as bad is it was several days ago when we went through it in the opposite direction. Perhaps traveling on this holiday did help a little. 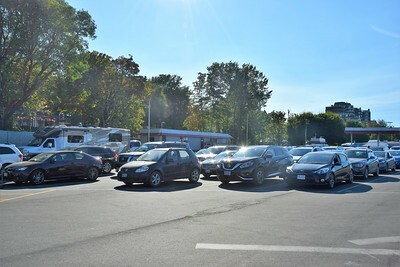 With our long lunch, the extended sit in the main construction zone, and other traffic, it took us six hours, to get to the ferry terminal and we arrived around 5:00. Having the reservations took away the stress of the uncertainty of being on stand-by for a spot, and we didn't have to arrive four hours ahead of time. while I went into one of the other lanes with the other cars. There is a sharp left turn to get on the ferry, so they put the larger vehicles in the right lanes to make the swing easier. 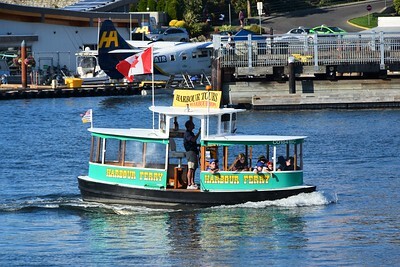 When you make reservations on this ferry, you only pay the ridiculous reservation fee, and then you buy your tickets when you arrive at the terminal. We got our tickets and then we just waited. 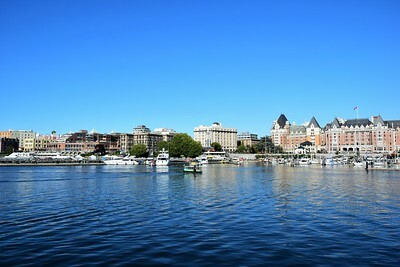 I took a few pics of the Victoria harbor just to pass some time. Border Security starts doing their checks going from vehicle to vehicle at 6:00 p.m. for the 7:30 departure, and that is when everyone is supposed to be in their vehicle ready to show your passports or other travel documents (90 minutes before sailing when on the Victoria side, 60 minutes on the Port Angeles side). Once the foot officers "interviewed" us, checked our passports and license plates, they sent us up to the passport processing building, where they scanned our passports and gave us a red ticket with the number of people in the vehicle to put on under our windshield wipers. That's some sort of pre-check, to make things go quicker when we dock at the terminal in Port Angeles. Once you are "processed" you can wander around, but you can't leave the terminal area. It took a little over an hour for them to check everyone, and Linda was one of the last vehicles checked. She got cursory, limited questions, while I got a few more probing questions from the friendly officer. Surprisingly, this check was less intense than when we arrived in Canada, but neither caused any anxiety. Linda and the other large vehicles boarded first, even before the ferry was finished unloading. Then the rest of us squeezed in. Again, we found a spot in the interior lounge. Not long after leaving Victoria, the fog rolled in, so there was nothing to see during the trip. We just read on our Kindles. Once docked, we exited the ferry and had a brief conversation with the border officer at the terminal exit. Very easy and efficient. 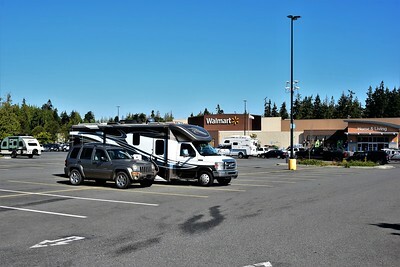 We had decided previously that we were going to stay in the Walmart parking lot in East Port Angeles tonight about four miles away. And since we were disembarking at different times, we just decided to meet there. It seemed all the RVs on the ferry had the same idea, as we recognized some of them among the fifteen or so RVs at Walmart. 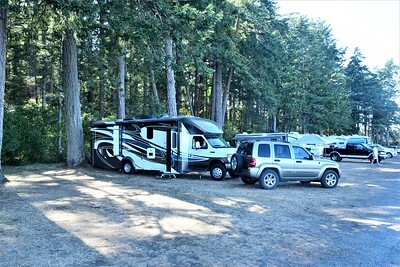 Oh, by the way, being tucked in the trees at Kitty Coleman Provincial Park campground, we didn't get much sun on our solar panels, and we declined to use our generator, so we discharged our batteries more than we have been, down about 40%. As a side-note, the park had fairly limited generator hours of 10:00 a.m. to 2:00 p.m. Anyway, our solar panels charged our batteries back to 100% on today's drive to Victoria. We're really pleased with how well our solar panels keep our batteries charged. We haven't used the generator to charge batteries since we got the system at the end of April. We were parked by 9:30, and called it a night around 11:00. 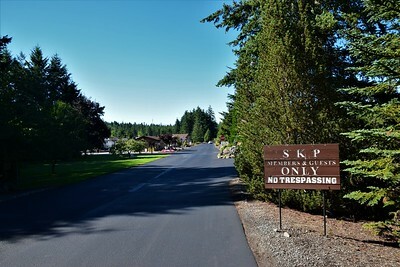 Tomorrow, Tuesday, we intend to go to the Evergreen Coho SKP RV Park in Chimacum just south of Port Townsend. We've been Escapees members for thirteen years, but we haven't been to this park yet. We don't have reservations, but we know they have dry camping spots for $5/night we can slide into for a couple nights. 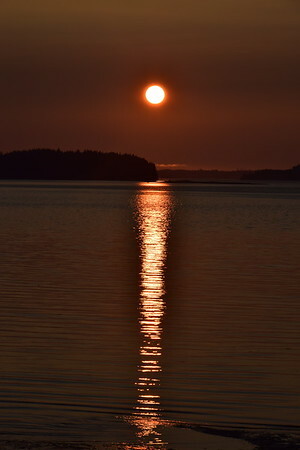 After our four-day adventure with Orca Dreams and a couple of days taking it easy at Alder Bay Resort, we met Rolf Hicker at the dock at 5:30 a.m. on Thursday morning and set out on a 12-hour tour to see bears, whales, seals, sea lions, dolphins, and more. 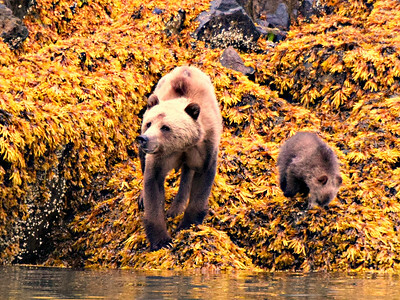 Click here for the details and photos: The Wildlife & Scenery Tour with Rolf/Vancouver Island Tours. 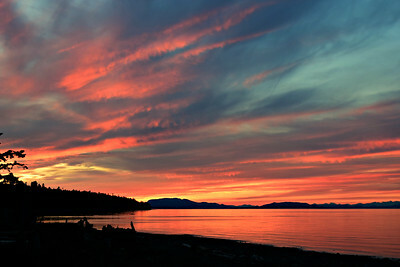 It was an amazing finish to our stay in the northern part of Vancouver Island. On Friday, we moved south hoping to cut our drive back to Victoria in half and enjoying a couple more days before leaving Vancouver Island. Linda found a Provincial Park that doesn't take reservations, Kitty Coleman Provincial Park, so we made that our destination hoping we would arrive early enough to get a site. 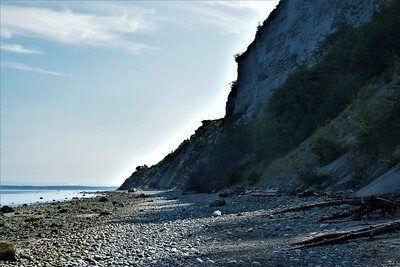 Kitty Coleman is a "Class C" Provincial Park meaning it is managed by a local community board. 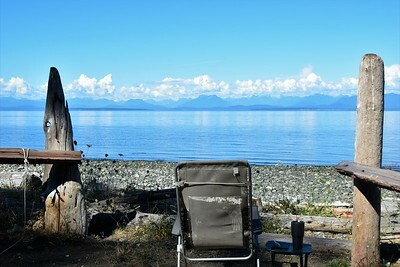 It sits right on the ocean, the Strait of Georgia, and has 65 campsites with no hook-ups. There is no dump station, but there is a place to take on water. Also, it's only $15 CAD a night which means it's under $12 USD. Cash only. We left Alder Bay a little before 10:00. 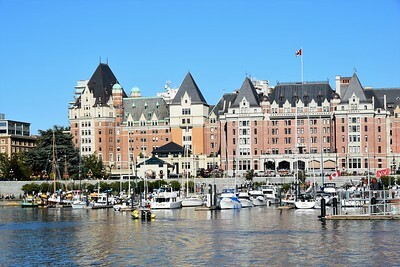 With Linda driving, I read through some literature and discovered that Monday was a holiday here - "BC Day". So, we were a little concerned about getting in on a long, holiday weekend. When we arrived at Kitty Coleman at 1:00, the Caretaker, Peter, said the guy in the motorhome that just arrived ahead of us got the last large spot, and he didn't have anything else that would fit us. Our Plan B was a nearby RV park, and Peter called them for us to see if they had any openings - nope. Most of the sites at Kitty Coleman are on the ocean, but Peter said he had a couple in the woods where we might fit. I hopped on his golf cart and we took a look. Yeah, I think we can get in there, but I'm not sure about getting level. We disconnected the Jeep and I guided Linda into the site. We decided pulling in would be better than backing in so that we would be nose down. If we have to lift one end of the motorhome to level, we want it to be the front end. We got in and got level. Whew, we got lucky once again. We wouldn't get any sun with our solar panels, but we figured we'd be okay for the three nights we intended to stay. I walked back and paid. We didn't have any Canadian dollars, so we just gave Peter the $15/day in USD. The site in the woods didn't have a view, but it was quieter and a little more private. 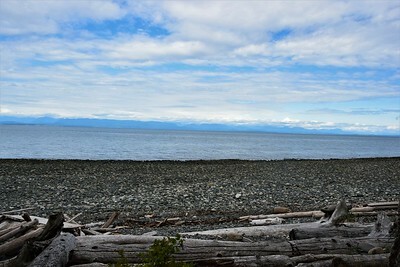 The beachfront sites have no privacy and they are stacked in tight, although the view of the Strait of Georgia and the mountains on the mainland would be worth it. There is no Wi-Fi here, but we did have service on our cell phones. After a lengthy phone call with Verizon, we learned that our plan included not only a 1/2 GB of international data per day in total, but rather a 1/2 GB of international data per device. So, between our JetPack and using our two phones as mobile hotspots, we have 1.5 GB of international data per day - that should certainly suffice during our last few days in Canada. Later, we took the short walk down to the very rocky beach where Linda immediately found some sea glass. It was low tide, and we're interested to see what it looks like at high tide. 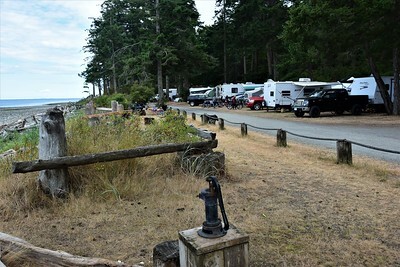 Here are a few of the beachfront sites, and an old water pump that is to be used to get water (non-potable) to douse fires in the firepits (when fires are allowed). 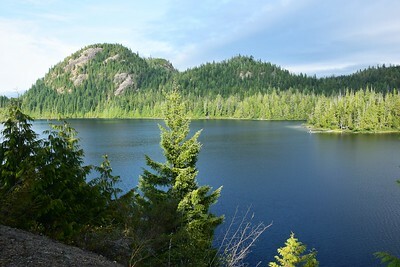 We walked the campground and enjoyed the views although we noted there was quite a bit of trash around the campsites and in the firepits (there is a fire ban in British Columbia right now). And there were some other sites open we could have fit in on the other side of the campground - we wondered if they were perhaps being "saved". We could feel a sense of entitlement among some of the campers as many rules weren't being followed (as we often find in campgrounds that primarily serve a very local clientele). It's kind of a strange set-up. Firepits are not in the sites themselves. 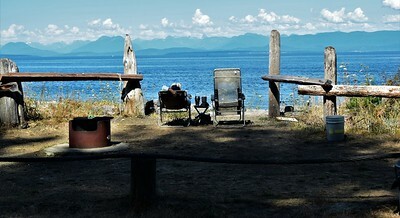 They are across the gravel road and closer to the beach, and there isn't one for every campsite, so it's like they are community firepits that get claimed by whoever gets there first. Of course, with the fire ban, nobody can use them. A few people are using propane firepits that they have brought with them, but I'm not sure they are supposed to be used either. There are five-gallon buckets of water near the firepits for people to dispose of cigarette butts, but smoking isn't allowed at all up in the wooded sites - a nice little bonus for us. 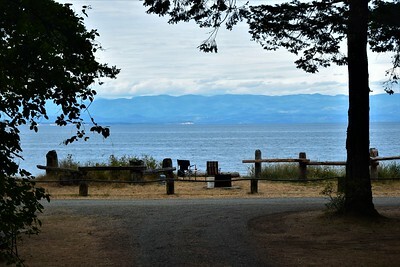 So, Kitty Coleman is sort of a mixed bag, but we can overlook a lot for $15 a night in a campground on the ocean that we were able to get into on a holiday weekend without reservations. We never got a neighbor up at our wooded site, so we had a very quiet night and slept late. I worked on photos from our tour on Thursday, and Linda eventually decided to walk the beach. She wasn't gone long before she came back and told me several of the beachfront sites were open. What? On a Saturday? On a holiday weekend? Sure enough five sites in a row were vacant, and we decided the view was worth making the move. So we made sure it was okay with the Caretaker, and then we moved to Site 20, right in the middle of the open sites. It's so easy to pick up and move the Aspect. Again, we wouldn't get much sun on our solar panels, but we would enjoy the views out our windshield. Unbelievably, the sites on either side of us stayed empty. 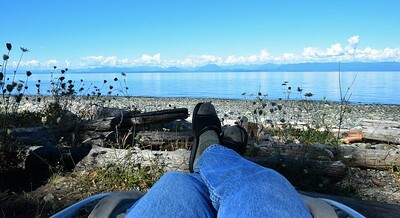 Later I set up my lounger across the road, and did some reading while enjoying the views and watching a couple of seals. After a successful sea glass hunt, Linda joined me and we stayed there until we got too chilly. I grilled some burgers and we retired to the rig only to return to the beach side when the sun set. We almost missed these beautiful colors. As the colors started to fade, fully lit up cruise ships were slowly approaching from the opposite direction. Several people stayed out to watch them pass. 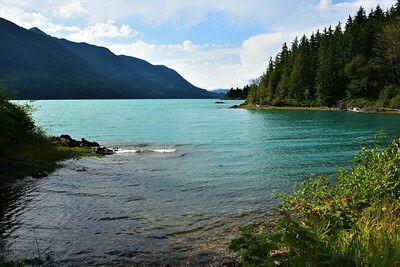 It was an amazingly peaceful Saturday here in Kitty Coleman Provincial Park. Again, the sites next to us stayed open all day. It wasn't until the late afternoon that a solo gentleman in a small Class B parked beside us on our driver's side. 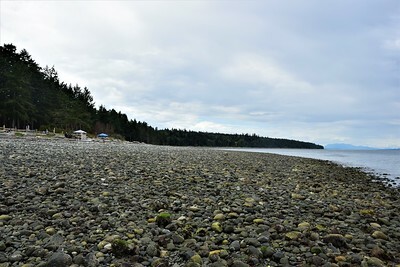 As the day went on, Linda decided to drive over to Miracle Beach Provincial Park to treasure hunt on the beach a little while I continued to work on finishing our post from last Thursday. She returned much sooner than I expected, and we once again set our loungers out by the beach. Today was much warmer, so I replaced the jeans and wool socks from yesterday with shorts and bare feet. 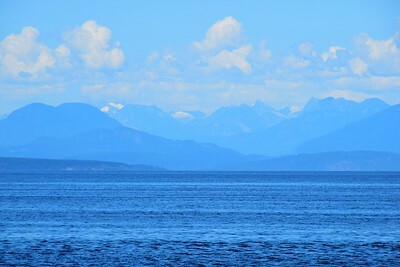 We sat out for longer reading and enjoying the views of the Strait and the snow-capped mountains on the mainland. There may also have been some napping in there as the wispy clouds passed overhead. Prior to dusk, the views of the mountains got a little better. 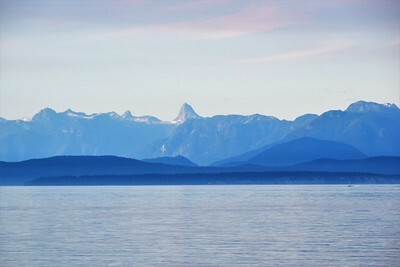 Perhaps some of our Canadian friends can identify the very pointy peak below. After dinner, we were treated to a magnificent sunset. 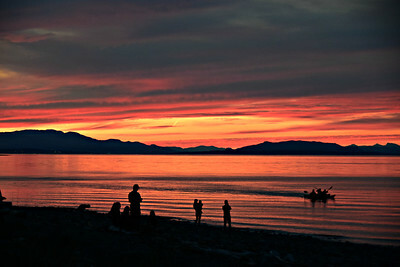 It was one of the prettiest, longest-lasting sunsets I've ever seen. 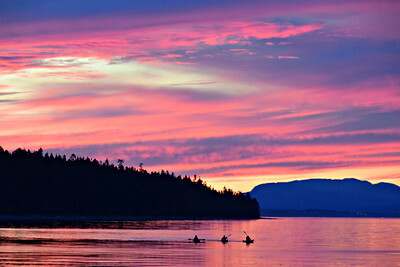 These kayakers were on their way back in the midst of the show. And the gorgeous colors drew lots of people out to the beach to watch. Simply stunning, and I once again got a little emotional watching nature's beauty. 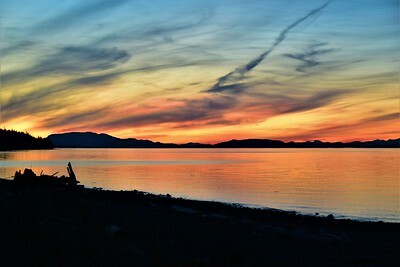 What a way to end our last full day on Vancouver Island. Tomorrow, we'll head to Victoria and take the ferry back to Port Angeles, Washington. This time I made a reservation. It's on the late ferry at 7:30, but that's okay - we'll be in no rush to get there. 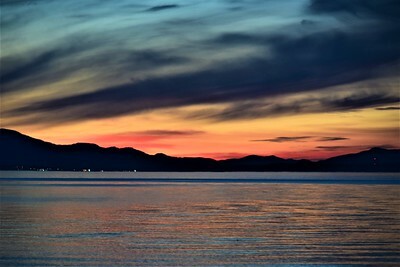 Thank you Vancouver Island for a wonderful week of natural beauty. I have a feeling we'll be back someday and we'll stay longer. 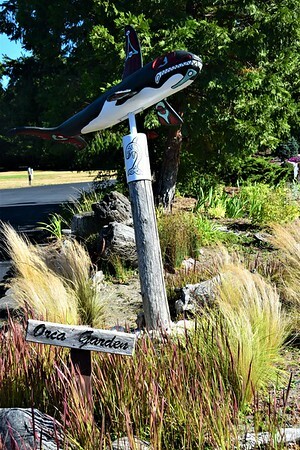 I know some of you have been wondering how our trip with Orca Dreams went. Well, it was awesome, and it has taken me a long time to go through the photos and write up the details. But that's now complete and you can read about it and see the best of the photos on our NatureTravelers.com website. What a birthday I had with by far the best whale-watching experience we've ever had. Multiple Humpback Whale sightings every day and Orca sightings our last three days including some time with the whales with no other boats or people around. Not only that, we could hear the whales blowing all night long - the best kind of "white" noise. And by the way, thanks to everyone that sent "Happy Birthday" wishes while we were gone. Yes, on Sunday, July 29, I turned 55 so I think that makes me eligible for a few "old guy" discounts. 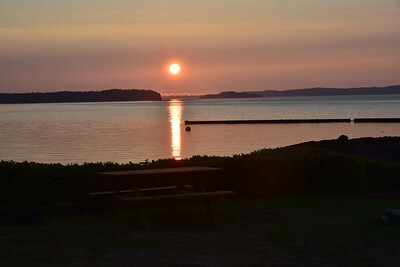 We stayed at Alder Bay Resort between Telegraph Cove and Port McNeill in the northern part of Vancouver Island. Our first night, July 26, we paid for a dry-camping sight, and then we left it there for the three nights we were on the Orca Dreams deal. They charged us a $10 CAD storage fee for each of those nights. When we returned on Monday afternoon, July 30, we moved to a full hook-up, pull-through site (30 amps) - Site 42.
but then had to run our utilities underneath the rig. Once we got settled, the first thing we did was take showers since we were unable to do that on the Orca Dreams island (water shortage due to a lack of rain had their tank low). 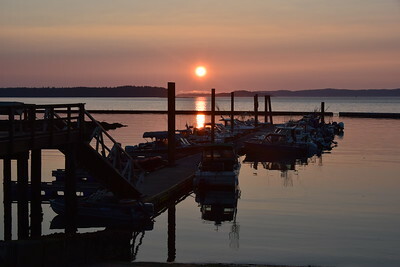 Alder Bay has a boat launch and a marina, and it's clearly a summer destination spot for fishermen. There are nice fish cleaning stations out by the dock. 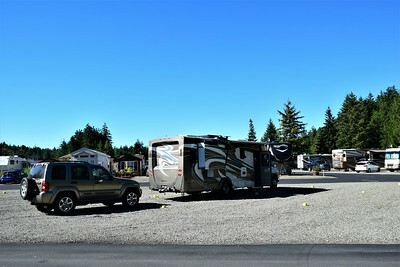 A few rental RVs came in from time to time, but it seemed to be mostly seasonal campers. 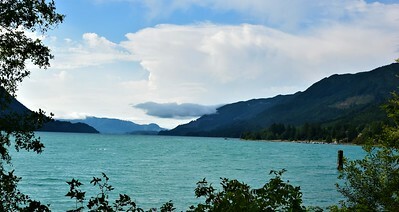 Alder Bay doesn't have its own Wi-Fi, and our international data included with our Verizon plan is only a 1/2 GB per day, not nearly enough to get our work done and upload all the photos we took over the weekend. But there is a local company called Ragged Edge and we could purchase a week's worth of data (up to 5GB before slowing the speeds) online for $15 CAD (about $12 USD). Since Verizon wanted to charge us $15 per GB, that was a pretty good deal. On Tuesday, Linda did laundry at the campground, and we didn't go anywhere. On Wednesday, we took a little drive in the afternoon. 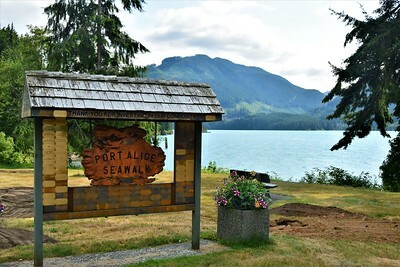 We visited Port McNeill and Port Hardy and picked up some information at the welcome center in Port Hardy. 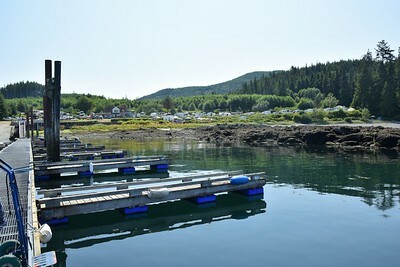 Neither town really intrigued us - Telegraph Cove is much more quaint and scenic. From there, we made the curvy drive to Port Alice which is a small village on a beautiful glacier-fed inlet, Neroutsos Inlet. admiring the glacier-blue water and surrounding mountains. and we made a couple of stops to pick some roadside blackberries and thimbleberries. 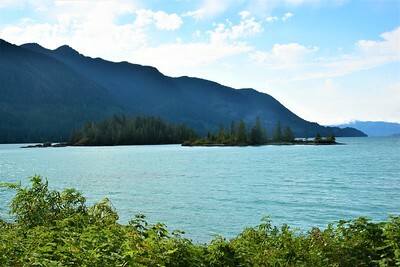 We continued driving toward the end of the inlet hoping for some more pristine views. Unfortunately the views of the scenic inlet were marred by power lines and a large cellulose plant. We turned around and headed back toward our RV park on the twisty road. 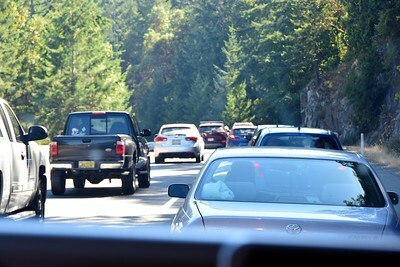 On the road to Port Alice there is a 13% grade hill, a 10% grade hill, and a 9% grade hill. They aren't long and they are lots of curves, but it would be nerve-wracking to have a large RV on that road. 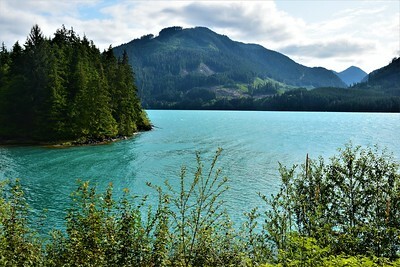 There were several pretty lakes along the way, and we stopped at an overlook for some more photos. 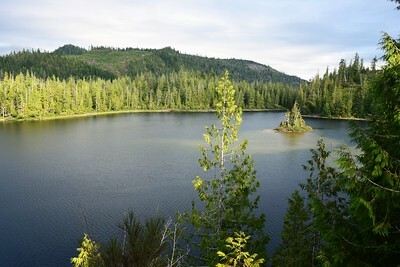 There are many beautiful, hidden lakes of all sizes in this area that would be wonderful to paddle. 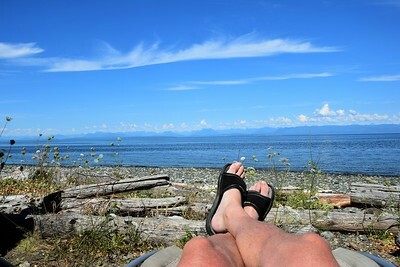 With the lakes, the ocean, the wildlife, and the lack of people, we may just have to return to northern Vancouver Island and spend a summer. On Thursday, we had an all-day wildlife viewing excursion with Rolf Hicker, a professional photographer and proprietor of Vancouver Island Tours and the Artists Point B&B. That was also amazing, and I'll get a post on that done soon .... after I whittle down the 1600 photos I took.